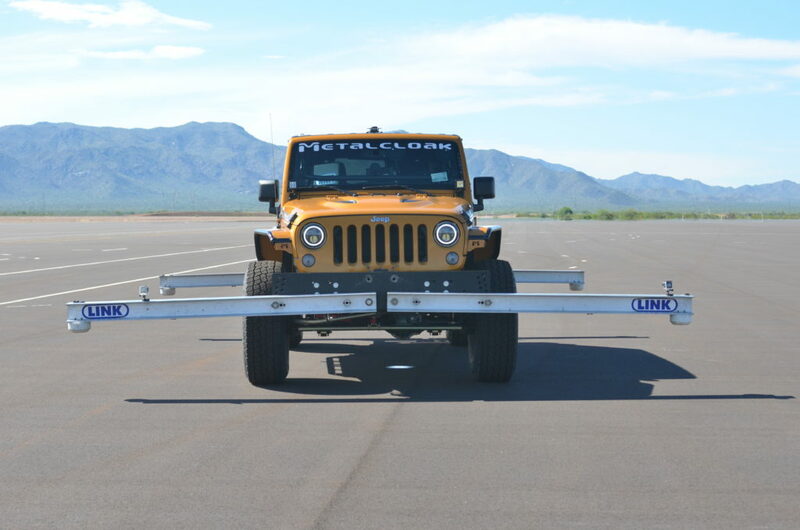 At MetalCloak we’re always trying to to push technology forward to provide a better product. When it was proposed to take our safety testing to the next level the entire team was excited to jump at the opportunity. Our extensive testing and real world use has proven MetalCloak technologies to perform to the highest standard for both on and off road. 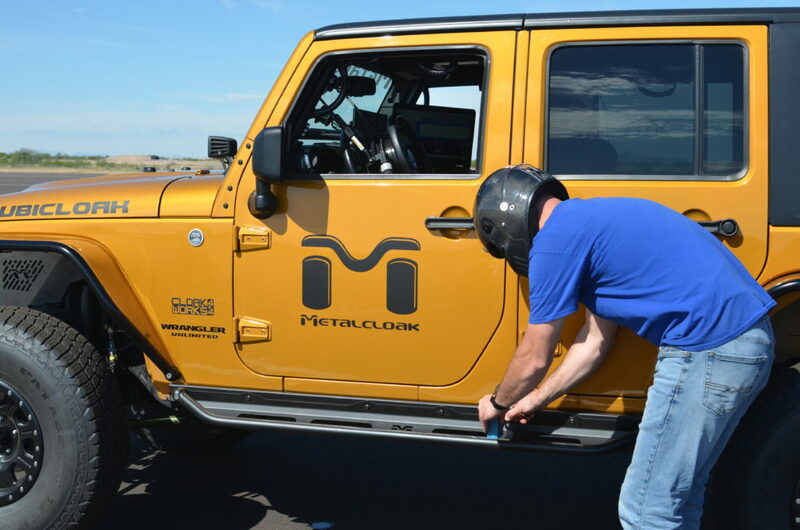 Now it was time to take on the Federal Motor Vehicle Safety Standard 126 test; a safety protocol designed to ensure that a modified vehicle can still meet national safety standards. As we usually do, we decided not to approach this test the way others in the industry have. We were confident that our suspension could meet the minimum standards on a basic, stock, Jeep with a modified lift. But we wanted to push it harder. Could a trail-tested Jeep Wrangler with full MetalCloak Body Armor, Undercloak Steel Skid Plates, MetalCloak 3.5″ Game Changer Suspension on 17″ aftermarket wheels and 37″ off-road ready tires perform above and beyond what the Federal safety commission requires? Why? Because this is the way most of our customers build their rigs. Our journey started months earlier scheduling the all-important testing at one of the few certified facilities in the country, choosing a Jeep to send and arranging shipment of our Cloak’d JK a full week in advance. They needed the extra time to install all the amazing equipment — steering robot, computer control, steering and braking monitoring equipment, the cool outriggers, etc. Our test rig this year on the Rubicon Trail. The Wrangler we chose to send is the same rig we use on the trails – most recently running the Rubicon with the ModernJeeper Adventures event. 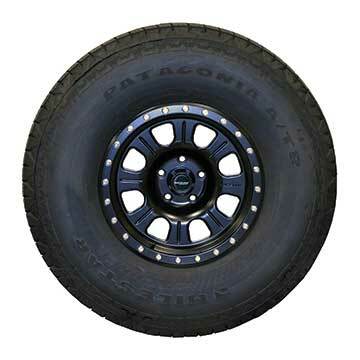 With all that trail mileage on our our current tires and wheels, our friends at Milestar Tires and Raceline Wheels graciously sent us a full set of new 37 inch Patagonia’s and a sparkling set of 17 inch Monster Street Locks to eliminate any possibility of a torn/worn tire or damaged wheel affecting the testing. Other than updating the shoes, we did not modify the rig from it’s trail-ready status… keeping the full Rock Hard Sport Cage, Undercloak Skid System, Metalcloak Overland Rockers and Overland Fenders in place. Front & Rear Bumpers were removed, of course, so they could fit the out-riggers. On shipping day, transport company showed up and was surprised by the size of the Jeep… LOL! Not familiar with lifted rigs, the driver hadn’t planned on the 37 inch tires or the additional lift and had to completely unload his truck and re-organize the entire load to fit our Wrangler. But, he was a pro and had the load redistributed and was rolling down the street in less than 30 minutes. As a suspension industry veteran and head of the media team at MetalCloak, I was designated the lead to monitor the test and document it for posterity. I scheduled my flight to Arizona, allotting 3 days for the total journey with the additional time to account for possible weather that could affect the testing days. Like any adventure you can never plan on traffic, flight delays, and car rental issues; of course I had issues with each of these categories! Mid day traffic, overbooked flight with no room for my camera equipment, botched car rental with no cars available when I landed and the list goes on. As a seasoned 4wheeler I kept my “get er done” attitude pushing and figured out how to get past each of the hurdles and walked out to view the only car I could find, a Toyota Corolla “S” model with freshly drying paint, still tacky on the poorly misaligned front bumper. I laughed a little (on the inside), grabbed the keys, loaded my camera gear in the trunk, fired up the econo box and powered through the busy traffic of downtown Phoenix. 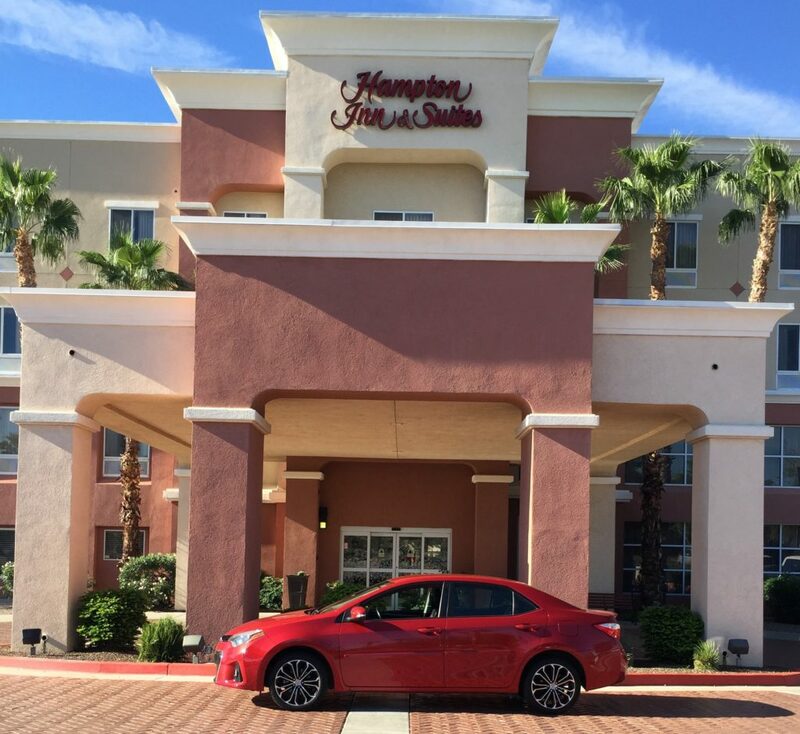 A short two hours later I arrived at my hotel in Surprise, Arizona. Wiped out from the days travel, I checked into my hotel and popped a tv dinner that I had picked up at the local Trader Joes into the microwave. I shamelessly inhaled that quick and healthy-ish meal before passing out for the night. 4:30 AM came too soon. A quick cup of coffee in the lobby and I was out the door and driving to the remote testing ground for the FMVSS 126 certification; not familiar with the area or the process I wanted to make sure I had plenty of time to check in and get my camera equipment set up. Pulling up to the guard tower at the test facility on a warm clear day, kinda reminded me of driving into a military base; they checked my ID, verified that I ONLY had the camera gear that I had pre-registered and reminded me that I was not to film ANY of the other vehicles in the testing area; then a serial numbered sticker was placed over the lens of my iphone and I was told that camera phones are not allowed… this is serious business. The gate lifted and I was directed through the compound to the testing lab where I was greeted by the engineers and analysts. Our group walked through the compound to another warehouse where the vehicles on site for testing were stored. 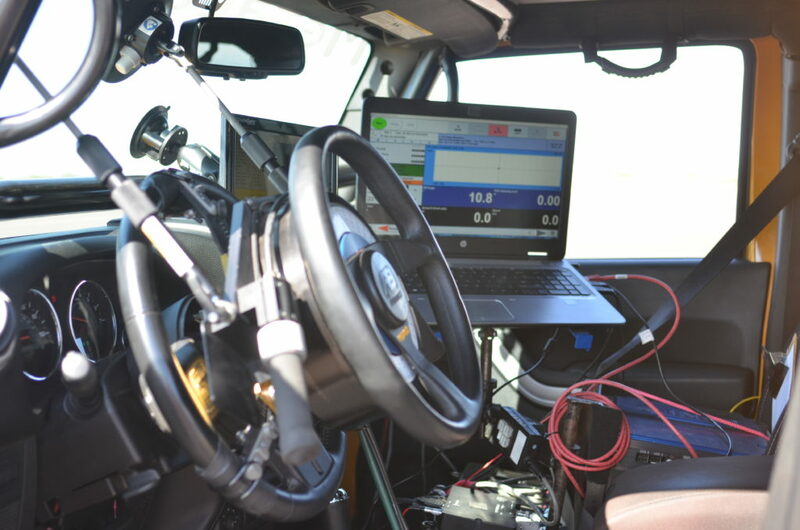 I was introduced to the test driver and we went over the testing equipment installed onto the Jeep. After a quick discussion the engineers and I loaded into a truck and went out onto the tarmac testing area with the Jeep following behind us. A quick radio call to the observation tower and we were cleared for the set area. I set my camera equipment up as the Jeep drove around to get the tires up to operating temperatures. The test driver and engineers met up with me right before testing and told me that they don’t usually see vehicles getting tested fully decked out with 37 inch tires AND the additional weight of armor protection; they seemed a little skeptical as they told me they don’t usually have good success with Jeeps on such large tires. As sure as I was about the quality of our product, they were still making me a little anxious. 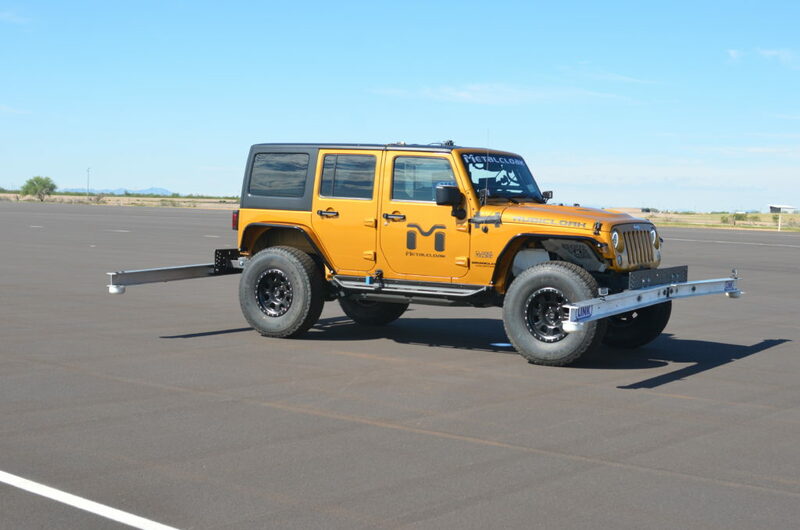 As far as tests go it seemed like an eternity out on the tarmac watching the Jeep fly past at speeds of over 50mph and whipping the wheel side to side as the tires squealed and moved forward to the next pass. Eleven passes for the right side turn and eleven passes for the left side turn had to be completed without any issues for the vehicle to meet the rigorous FMVSS 126 Safety Standards. I watched as the engineers were scribbling data down on their notepads and talking with the driver over the radio without disclosing much as how the Jeep was performing… raising my anxiety more. On the final pass the driver swung his hand out the window to give me a big thumbs up! Although the technical data was not compiled this was a surge of relief. We got a big thumbs up! We loaded up and went back to the engineering office for the data to be analyzed and a little more waiting. After about an hour the lead engineer came out with a somber look on his face and a pile of test data printed out… he shook his head slowly… and suddenly he cracked into a big smile and shook my hand and congratulated me on a great test with a 100% pass! The trail-tested JK Wrangler with oversized 37 inch tires, fully Cloaked with body armor and skid plates, and lifted with the 3.5″ Game Changer Suspension (RockSport Edition) proved to be one of the best Jeeps ever tested! The group gathered and congratulated me on the results as we arranged for our Wrangler to be shipped back to our California headquarters. As I climbed back into my Corolla and started the drive back towards the hotel, the sky grayed and my phone sounded an alert… Flashflood alert… what!?!? The sky literally opened up and it was as if a dam broke open from above. 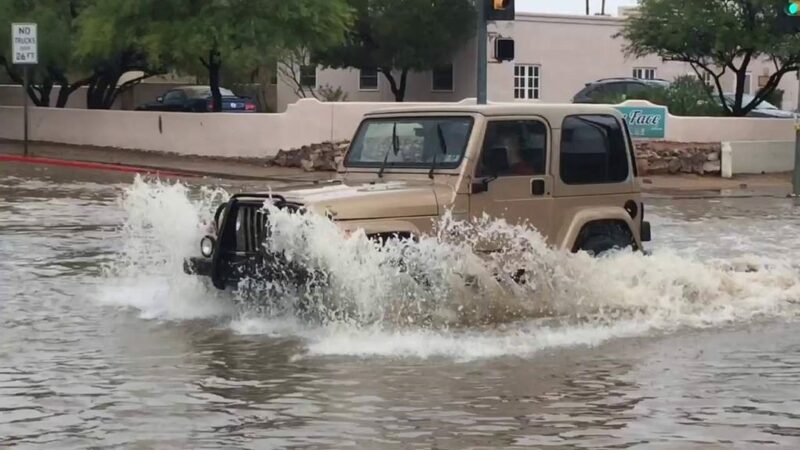 I drove on the edge of the road through a foot and a half of water listening to the gurgle of the little Corolla’s muffler in the water… great, sure wish I was in the Jeep. With a little prayer and a lot of luck, I made it back to the hotel with out issue and chocked that up to another interesting experience. Waking the next morning I was relaxed and with my camera gear packed back into the “s”ardine can, I had plenty of time to make it back to the airport for my afternoon departure… and a problem-less return home. As I drove back to Metalcloak from Sacramento International Airport, I was excited to get back and tell the crew at the shop the great news and go over all the details of my latest adventure; this one turned out to be… well… a real Game Changer. Awesome write up Scott!! The story of the process was like being there! Nice write up, and if anyone ever had any doubts about the quality of a MetalCloak lift, they are all cleared up now!